You are here: Home / Notes 101 / Note Marketing During the Holidays? …but there are DOWN times that you will want to pay attention to while deciding how and when you are marketing. Well, for starters, we always want our message to be read. Or, at the very least, the best possible chance of being read. If it is a direct mail piece, we want the best chance of it being seen and read. For example, I wouldn’t send my direct mail piece anytime within two weeks of a major election. It just seems like everyone’s mailbox is jammed full of oversized postcards from hopeful candidates trying to get your vote. The second reason is that we really don’t want to waste any money. This seems like a given but if you are not mailing the same holder more than once OR you are not A/B testing your marketing pieces, you are, in a sense, wasting money. So, what other times aren’t best to market for real estate notes? Well, although different note investors might give you a different answer, I am going to say all of it. That is not to say that you can’t do deals in December. You certainly can. But, odds are, if you are closing a deal in December, it is because you signed it up in October or November. People are distracted by the holidays. Hanukkah, Christmas, office parties, taking the kid to see Santa, whatever. They are not looking to start a financial transaction during this time of year. …look out! That is when the landslide of mom and pop note sellers will start. We find January to April are great months to start looking for notes and to market for private mortgage notes. At the beginning of the year, people are paying off holiday expenses or getting their dream item as a New Year’s Resolution. Come April…well…taxes. Need we say more? No matter what the reason…those are the hot months. We like to use the December downtime to brainstorm and set goals for the following year. Don’t wait until January 1 to set your goals – you want to hit the ground running! Any other times you might back off the note marketing? The only other time I would say to slightly dial back your marketing expenses would be during the dog days of summer. Kids are out of school, and there are lots of family vacations. But hey, when they get back from Disney, they might need to sell a note! For similar reasons to after the winter holidays, the months of September through mid-November are also hot marketing times. Your results may vary! 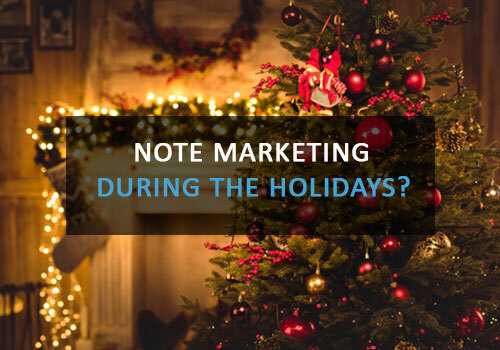 For example, if you are marketing for bank notes (rather than seller financed notes), they often need to get non-performing assets off their balance sheets at the end of their quarter or the end of the year. Like all marketing test, test, and test again. Pay attention to slower times, save a few dollars on note marketing costs, and set goals for the next wave of responses. Great article! I think using December to prepare for January and beyond is always useful. (Some of the best job finds I have personally had were in December. When everyone said oh, wait til January. I just went on with December in preparation for January, and I would have a job come January. Funny how that works.) I say work December for January! Thank you for posting this, great timing as I was preparing to start on my big push. I will now spend my Christmas week off, getting my ducks in a row and my marketing ready to mail out in January.